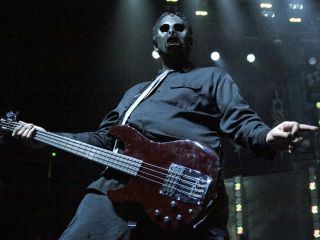 Slipknot bassist Paul Gray's cause of death could take another four to six weeks to determine, according to authorities. Officials said that an autopsy completed Tuesday morning did not conclusively show why Paul Dedrick Gray died. Polk County Medical Examiner Dr. Gregory Schmunk said the cause of death is still under investigation, pending the results of the toxicology testing. The autopsy did confirm police detective's initial investigation that there was no evidence of foul play or trauma, and that Gray had been dead for several hours before his body was discovered. Police said that the Slipknot bassist was found at 10:50am Monday morning (24 May) at the TownePlace Suites by Marriott in Johnston, Iowa. Gray, 38, a founding member of Slipknot, who was also known as #2 and 'The Pig,' is survived by his wife, Brenna, who is expecting their first child.